After the first day, Japan led with 28 points, followed by Australia with 27, Britain with 22, the United States with 20 and France and China with 19 points each. 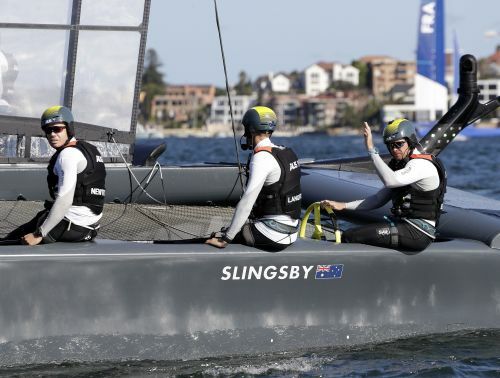 The boats will meet in five races in Sydney, with the two highest-scoring boats facing off against each other in Saturday afternoon's final. Teams will compete at five tour stops, with the finale being a winner-take-all, $1 million match race between the top two teams to crown the 2019 champion. After Sydney, the tour stops in San Francisco on May 4-5; New York on June 21-22; Cowes, England, on Aug. 10-11; and Marseille, France, on Sept. 20-22 for the final that will include the winner-take-all $1 million match race.